The rapid advancement in internet and technology has opened up a new realm of possibility in education, namely E-learning or online education. In a span of five years, 2004-2009, a growth of almost 15 percent has been recorded in the field of online education, which demonstrates the increasing acceptance for e-learning among the general public. A study conducted in the United States has shown that almost 45 percent of the students in the United States have opted for one or the other sort of online education and it is also forecasted that the number is bound to reach a humungous 80 percent by the year 2014. The earliest instance of using computers as a medium of education cited is the instance where two psychology professors Patrick Suppes and Richard. C. Atkinson from the Stanford University used computers to teach math to young kids in primary schools. This later went on to become the Stanford Education Program for Gifted Youth. Initially, the role of computer was limited to just replacing that played by a teacher, thereby reducing the autocratic feel associated with it. But over the years, the whole idea of E-Learning itself has seen lot of progress from what was conceived by the duo. The second generation of E-Learning called E-Learning 2.0 (named so to resemble Web 2.0 which played a major part in the progress of E-Learning), more than just being an educational packet served to the students, also grew to be a platform for the students to hold fruitful discussions on various topics of education. The revolutionary concepts of social learning and the using of blogs, podcasts and wikis as a tool to aid education was brought about by E-learning 2.0. E- Learning is naturally a more suitable medium for distance learning but is also sometimes used in combination with the traditional ways of learning. This mixed way of learning is very popular and is called Blended learning. However effective this type of learning is, but the real boon the advances in E-Learning has been to the population who are physically or logistically challenged to make to the traditional schools. Before the advent of E-Learning, majority of the population in the United States had education taking the last place in their priority list as they found it really taxing, financially, to get back to school. Getting back to school would not only mean paying a huge amount as tuition fees but also that they would have to live on the meager sum a part time job would fetch them during their whole course of education. The idea of flexible learning, back then was limited to night schools which was not acceptable to a major part of the population. With E-learning, Flexible learning has been a given an all new color and magnitude. E-Learning programs could be broadly classified into two types- synchronous or asynchronous. An asynchronous system necessarily means that the participants may indulge in exchange of ideas and information without being dependent on the availability of other participants at the same time. This gives a student the license to work at his own pace and take flexible learning to a different level altogether. This type of learning is prescribed for people who do not have a regular pattern of studies, for instance businessmen. A synchronous program demands the presence of all the participants at the same time, making what one would call a virtual class room. These programs are found to be much more productive as a lot more information exchange happens during such a program as opposed to an asynchronous one. BEST COLLEGE HUNT intends to do that on your behalf. We ensure the authenticity of every college listed on our portal. We review them critically and finally rate them on an overall basis. If you are an aspirant who would like to opt for an online course and would like to weigh your options before making up your mind, look no further than the BEST COLLEGE HUNT. 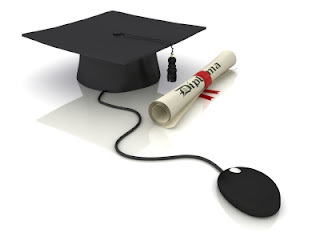 Online education is a best way to get more knowledge and its also the need of the hour.Modern education is incomplete without online studies.